South Koreans' attendance rate at cultural and art events has surpassed 80 percent for the first time. 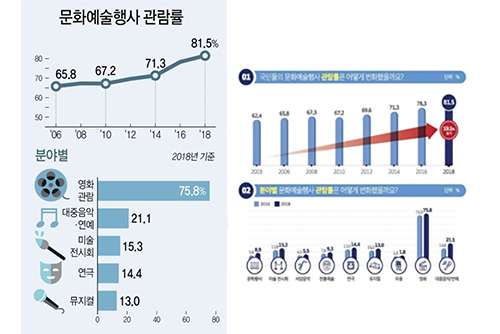 According to a survey released by the Culture Ministry and the Korea Culture and Tourism Institute, the rate of public attendance at cultural and art events rose to 81-point-five percent during the past year, up from 78-point-three in 2016. It's the first time the figure has topped 80 percent since the government survey first began in 1988. The rate has been on a steady rise from 62-point-four percent in 2003. Going to the movies garnered the highest percentage at 75-point-eight percent, followed by pop music and entertainment at 21 percent and art exhibitions at over 15 percent. Watching theater productions and musicals trailed the list. The survey is held every other year in the aim to better grasp the demand and needs of Korean people's cultural enjoyment. The latest poll was conducted in October and November on over ten-thousand people 15 and older nationwide by visiting individual households. The one-year survey period is from August 2017 to July 2018.